It hasn't been just Miss America contestants that have wished for world peace over the years. In April 1967, this article titled "World Peace and Amateur Radio" was published extolling the efforts of Ham radio operators in attempting to break through communications barriers erected by governments. Amateur signals could reach into the USSR, Cuba, China, North Korea, and all the other hopelessly oppressed regions of the world to let people know that there is hope beyond the Iron Curtain of Communism. This particular story reports on one Ham's outreach to the people of Japan which, fortunately for them, was not a member of the Red club. Believe it or not, there are still two countries - Yemen and North Korea - that prohibit amateur radio communications. Would you believe that the most famous radio amateur in Japan lives in San Francisco, California? It's true; he is Ray Eichman, WA6IVM, who has QSO'd over 3500 different Japanese radio amateurs, many of them 50 or more times. What does this have to do with world peace? Well, when General Dwight D. Eisenhower was President, he sponsored the "People to People Program" to promote world peace through understanding. Radio amateurs have been - and still are - in a unique position to pursue this program, and WA6IVM's contribution is an outstanding one. Ray's story begins in early 1959. Then a new Novice, he worked his first, honest-to-goodness DX - a Japanese station - on 15 meters. From that time on, JA call letters began appearing regularly in Ray's logbook; and the more JA's he worked, the more im­pressed he became with their courtesy, friendliness, and good operating habits. Learning that many Japanese amateurs knew only enough of the English language to exchange signal reports, names, and weather reports, Ray started studying Japanese in night school. Two years later, he was able to "rag-chew" on phone or CW with the JA's using either Romaji (conversational) or Hitigeni (syllabic) Japanese. By 1964, Ray had worked over 2000 different JA's, and the urge to visit them in their own land became overpowering. So he and his wife mortgaged the family cars, drained their bank account, and took off for Japan armed with the names and addresses of hundreds of Japanese amateurs and 1000 blank QSL cards. All of the latter were passed out before they were home again. The Eichmans traveled over 2000 miles in Japan - but not a mile over the regular tourist routes. Instead, wherever they went, they were the guests of Japanese amateurs and their families. Ray knew them all, their joys, their problems, their plans. Every meeting was like a family reunion. After the Eichmans' return from what Ray calls "the land of the friendliest hams," he resolved to try to work all of the active JA's. At the last count, he had worked some 3538, most of them many times, and over 2000 of them on 40 meters. Practically every contact is a friendly conversation, and not just a "hello-goodby-please-QSL" formality. While WA6IVM now uses high power and beam antennas, he has worked many JA's and other DX stations with less than 75 watts and a simple antenna. And the average JA he works uses a 15- to 25-watt transmitter and a simple dipole or vertical antenna; only a few of the Japanese hams run high power and sport high-gain beams. Ray does not spend all his on-the-air time working Japan, however. He is also an avid, all-around DX chaser, contest operator and certificate collector. One certificate that he is especially proud of shows his honorary membership in the Japanese Blind Ham's Club; he sells seals similar to Christmas and Easter seals for the club. One week Art teaches code and Ray teaches theory; the next week, the tasks are reversed. Most of the teaching is "by ear," depending upon the special needs of the individual student and the ingenuity of Ray and Art to devise methods - such as special keys for sending the code - to meet them. 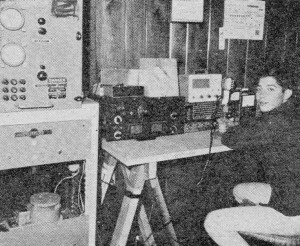 The Recreation Center's amateur station and antennas have been installed, the latter by members of the San Francisco Radio Club. As soon as one of the students earns a General Class license, he or she will become trustee for the station license, and the Center will be on the air - probably before you read these lines. Italian Government Honors W6MLZ. An­other "Ray," who also hails from California has been honored for his efforts in connection with handicapped people. In Genoa, Italy, last Columbus Day, Sentor. Guido Carbellini, Italian Minister of Scientific Research, presented to Ray Meyers, W6MLZ, Santa Gabriel, Calif., the 1966 Columbus Gold Medal Award for Humanitarian Service. The award was in recognition of Ray's work in teaching radio communication techniques to the physically disabled. 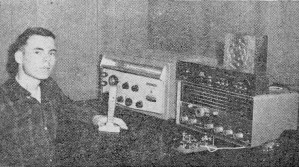 W6MLZ founded the "International Handicappers' Net" on 14 MHz phone, and invented special radio equipment for blind operators and those confined to iron lungs. He and his wife attended the presentation ceremony as guests of the Italian government and received "red carpet treatment" during their entire stay in Italy. Land QSO Party. To participate in this QSO contest, you operate any 24 hours between 0000 GMT, April 29, and 2400 GMT, April 30, near 3520, 7060, 14,080, 21,050, 28,020 kHz (CW), and/or 3820, 7220, 14,260, 21,380, 28,560 kHz (phone), and on all Novice frequencies. Amateur operators outside of New England work New England stations; New England operators work the world. Each station may be worked once per band and mode, and a complete contact consists of sending and receiving serial number, signal report, state, county, and the operator's name. Count one point for each complete exchange (five points for Novice contacts); and multiply the contact points by the sum of the states and counties worked. Send complete, legible logs to Carl Porter, 19 Penniman Terrace, Braintree, Mass. 02184 not later than June 15. Include a stamped return envelope if you want a list of the winners. 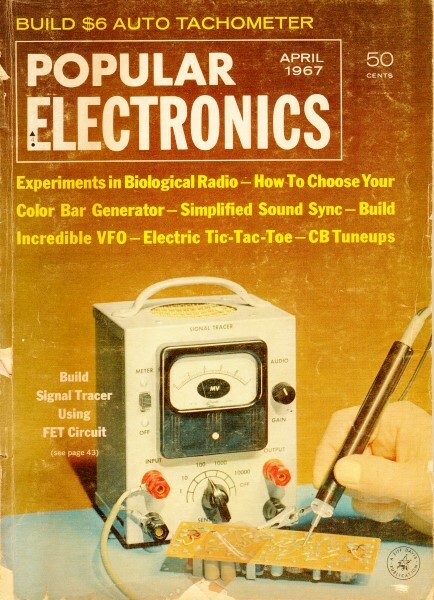 We are proud to select the station of Ray Eichman, WA6IVM, as Amateur Station of the Month for April, and are sending him a one-year subscription to POPULAR ELECTRONICS. 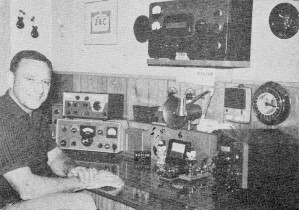 For the story of Ray's adventures in amateur radio and his public service activities, see text above. If you would like to enter our monthly photo contest, submit a clear picture of your station - with you at the controls - and some information about your amateur career and the equipment you use. Even if you do not win, your photo may be used if space permits. All entries should be mailed to: Amateur Radio Photo Contest, c/o Herb S. Brier, W9EGQ, Amateur Radio Editor, Box 678, Gary, Indiana 46401. Stark simplicity seems to be the motif at the amateur station of Charles Barenfanger. WA9OPW, Vandalia, Ill. Chuck keeps his Johnson "Invader" transmitter and Hallicrafters SX-111 receiver tuned up on 80- and 40-meter CW, and is just a few cards away from his Worked All States certificate. Of all the equipment in the shack of John Meyer, WA3EGY, Cheverly, Md., the big worker is the Heath-kit "Twoer" - it has made 70 contacts so far with the aid of an 11-element beam. Currently under construction is a 2-meter kilowatt transmitter.